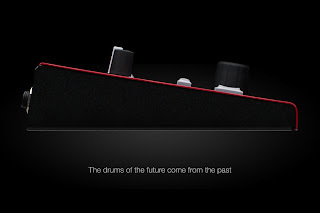 The Synthesizer Sympathizer: The Year of the Drum Machine: Clavia Nord releasing a new drum machine? The Year of the Drum Machine: Clavia Nord releasing a new drum machine? Clavia Nord released this teaser image for NAMM coming up, which shows off a new piece of gear that looks alot like our friend Dave Smith's Tempest. Could this be a lower cost drum machine? Is Nord taking a stab at DSI? More importantly, will it be a standard drum machine type, or some sort of machine playable with sticks, as one of their other images hints at? I hope it's a standard drum machine-- not all of us can afford fancy Tempests, and Nord would certainly be cheaper if it were digital. Click here to read the 2016 Synth Guide! This website is support via referral links to websites like Amazon. If you'd like to support this blog, use the links in the guides or on the sidebars. © The Synthesizer Sympathizer. Powered by Blogger.